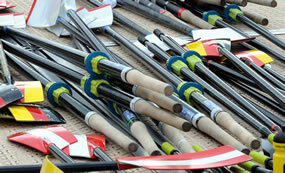 Concept2 travels to several regattas each year to assist regatta competitors with any oar service needs. Please refer to our Regatta Service Policies and Practices. Catch us at the following events in 2019. *Regatta Light: We will have a marketing tent in the vendor area and have a limited supply of oar parts for small repairs. Please contact Kate Smith at Concept2 with any questions. The purpose of regatta service is to replace wearing parts on oars (grips, sleeves) and repair, where possible, damage related to typical use. Work is done first-come, first-served, no reservations. Parts and labor are free of charge. Oars being used for racing are given priority. Oar shafts broken in half are not repairable and will not be replaced at a regatta unless prior arrangements have been made with Concept2. Please bring 1 set (4pr or 5pr) of sweeps and/or 5pr sculls MAX. If we are able to accept more, we will let you know at check-in. Oars must be picked up by the end of racing. Customers should check back throughout the event to see if the work is done. Concept2 is not liable for oars that are not picked up, lost or stolen. Certain work, such as blade and handle replacement, is deemed to be an “upgrade” rather than a standard repair. Upgrade parts must be purchased and shipped to the customer prior to the event and brought with the oars for free installation. Because of space limitations, Concept2 is unable to bring new oars to regattas. Head Of The Charles Regatta®. Contact denah@concept2.com (800.245.5676) for more information. Henley Royal Regatta and Henley Women's Regatta Oar Rentals: Contact Robp@concept2.co.uk (+447772 057 910) by April 26th for Women’s Henley and May 3rd for Royal Henley. Rental request after these dates will be standard specs from stock. If you are wanting to race/train before the event the order must be placed earlier. Concept2 repairs oars for the lifetime of the oars, regardless of the oar purchase date and regardless of transfer of ownership. Oars will not be worked on only if they are deemed “unrowable" upon inspection by a Concept2 Oar technician.